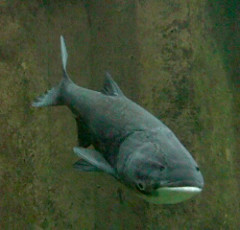 It's a modern-day eco-horror story: Asian carp are slowly creeping up the Mississippi, en route to Lake Michigan, slipping through various barriers that humans have put in place. Once they reach the Great Lakes, the effects could be horrendous—the carp have a tendency to gobble up everything in sight and could overrun the place, crowding out trout and other native species. Oh, and plus the massive carp have a nasty habit of leaping eight feet up in the air when startled, smashing their 100-pound bodies into the unsuspecting faces of fisherman and water-skiers. Not good news for the region's $7 billion recreation industry. Michigan Attorney General Mike Cox is again asking the Supreme Court to order the locks closed full time until the government can figure out how to beat back the voracious fish, which have advanced past the electrical fish barrier on the Illinois canal about 20 miles downstream from Lake Michigan. The court declined a similar request last month, but Cox, who is running for governor, is repeating the request because of recent news that carp DNA had been found in the open waters of Lake Michigan, adding another layer of urgency. The idea that the carp can be stopped from swimming into Lake Michigan by shutting the locks for days on end and then periodically reopening them for barges does not sit well with him. "That sounds as logical as keeping criminals in jail four days a week and hoping the other three days go well," said an e-mail from his office. At this point, Lake Michigan's best hope may be... Mother Nature. Some experts think there's a modest chance the carp might decide not overrun the Great Lakes after all, seeing as how they need long rivers to spawn and may not find enough plankton in the lakes to stay. As U.S. Geological Survey biologist Duane Chapman told Time, "It might be 20 to 25 years before they really establish themselves. We don't know for sure that we'll have any problems to speak of." Not wholly reassuring though.